After our adventures under the sea in the Galapagos, it was time to take a trip around the islands in hopes of seeing what wild animals roamed these special places. 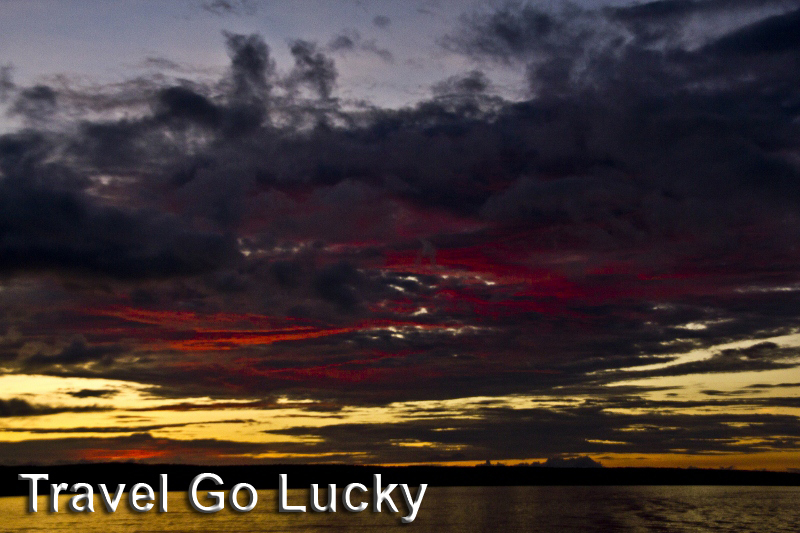 Dana and I were lucky, managing to sneak onto a 5 day trip around the southern circuit of Galapagos Islands for a great price. The night before embarking on our cruise, we enjoyed one last meal on Santa Cruz with our diving friends Mike and Sandi. They were one of the nicest couples we have met on our trip, and we hope to meet up with them again down the road sometime. The next morning we took off to the meeting area for our cruise. Most people who would be on our cruise were just arriving by plane from the mainland. It turned out that a family from Wisconsin ended up on our tour, which was a nice surprise. Once everyone was rounded up, it was off to hop on our boat and check out some sights and wildlife. 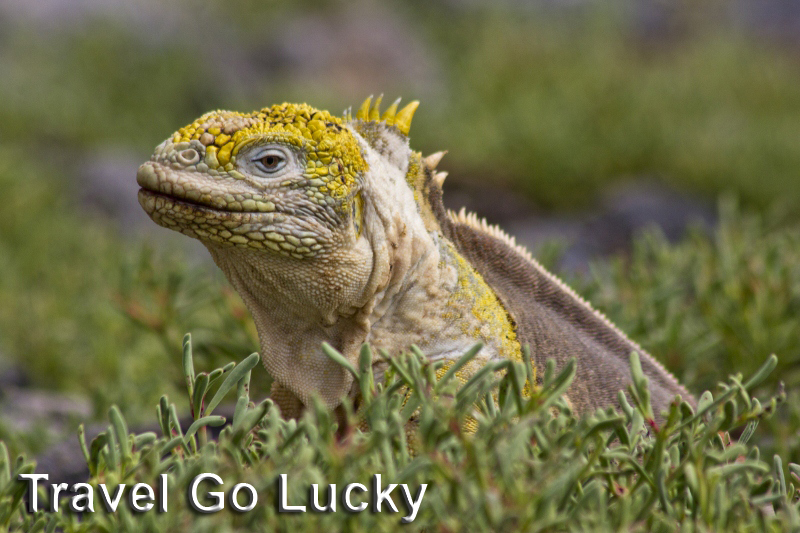 Our first island stop brought us to see land iguanas. These guys look like a dinosaurs cousin, but there is nothing fearsome at all in their demeanor. They like to sleep and hang out, not very active creatures. 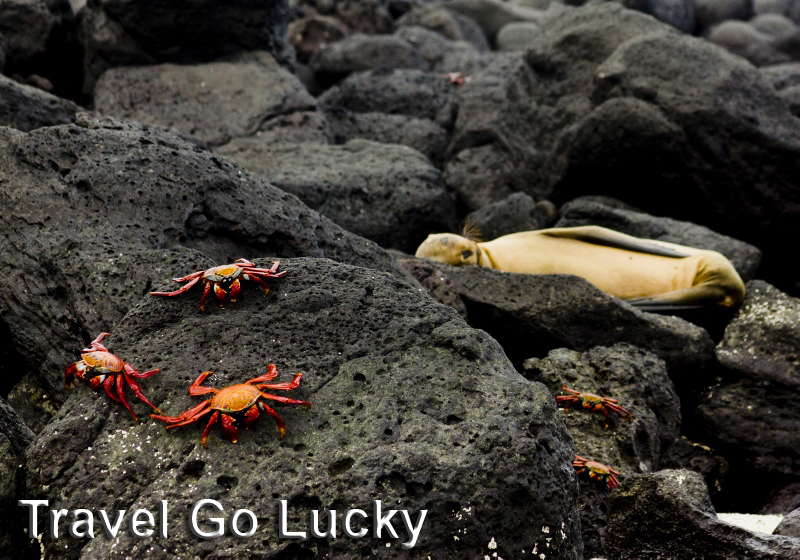 We also ran into our first Galapagos Seals and the colorful Sally Lightfoot Crabs. All you hear about before arriving in the Galapagos is how unafraid of human like the animals are, but hearing and experiencing are two different things. The seals would literally make you step over them at the first dock we landed. They could’ve cared less that we were there. 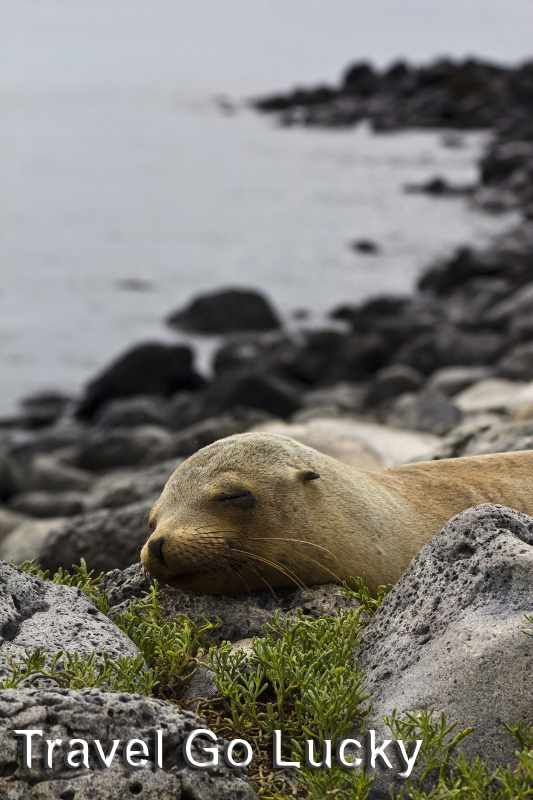 If a sleeping seal is in your way, don't expect him to move! 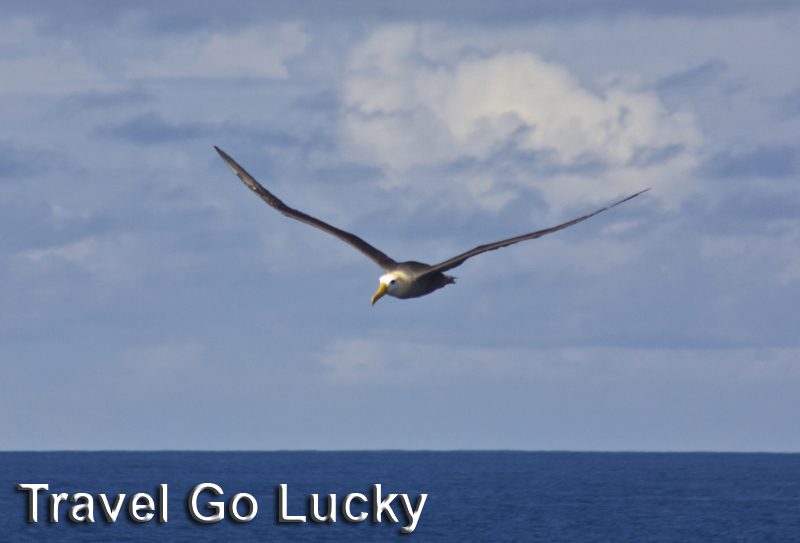 Our tour continued on with a stop to see the nesting grounds of the Waved Albatross. 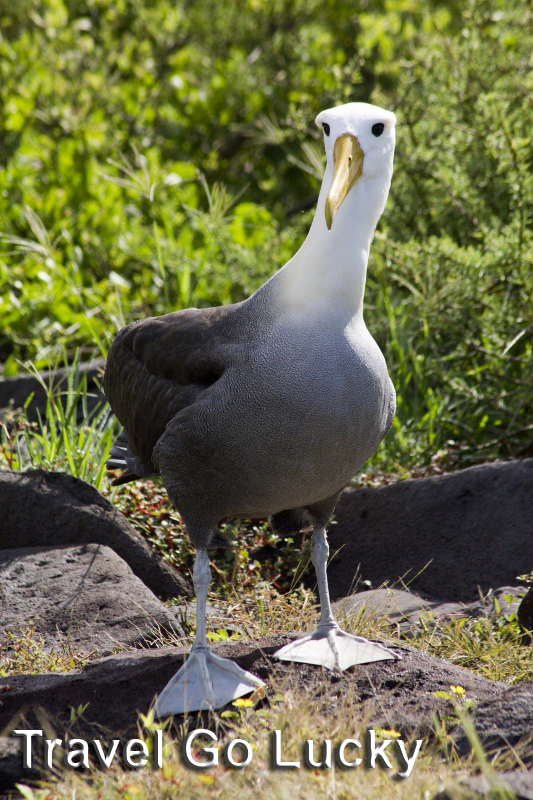 These guys looked very similar to the ones we saw trailing our boat in Antarctica, but this species sticks mostly to the Galapagos. 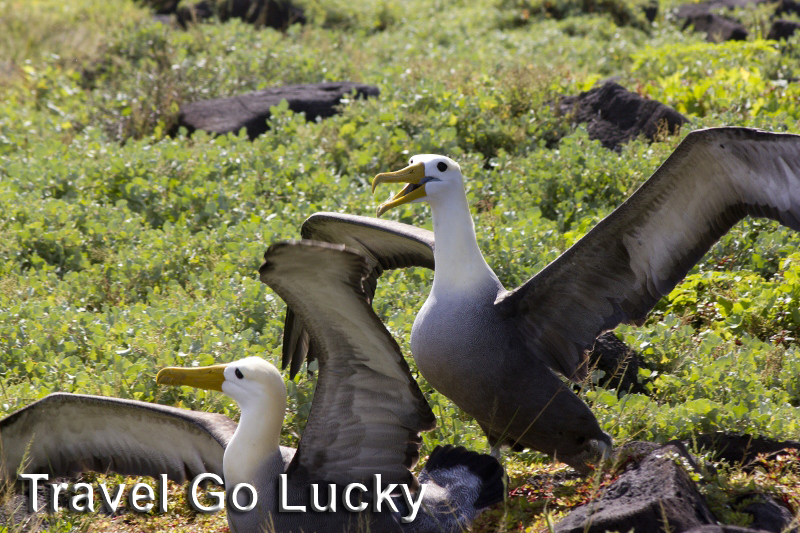 It is hard to appreciate these birds in photos because they look like a giant seagull, but to see them in person is breathtaking. They look like miniature planes when they fly above. At the end of our first day, I had a special surprise ready for Dana– a birthday cake! 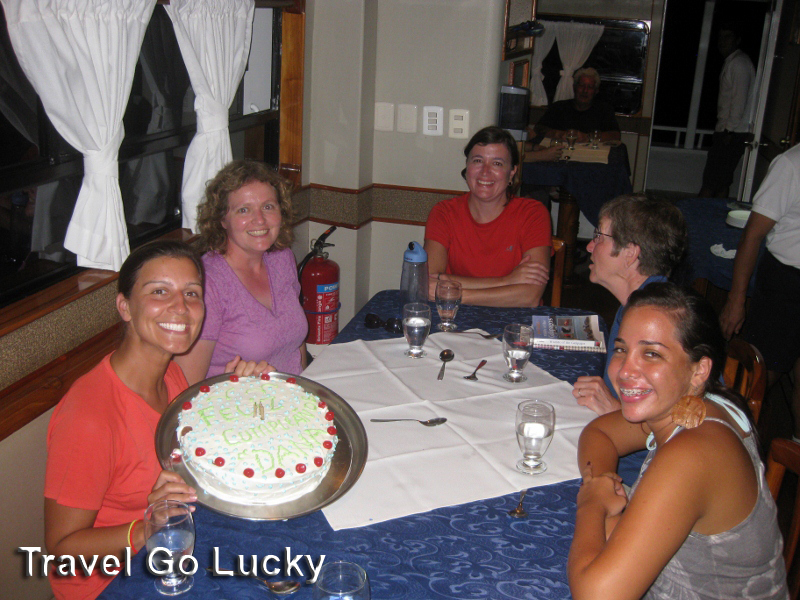 The crew baked her a cake while we were out sightseeing all day- pretty impressive for being on a boat. Everyone sang happy birthday and then recounted experiences from our first day of exploration. It was an early night though, because more adventures await bright and early the next morning. 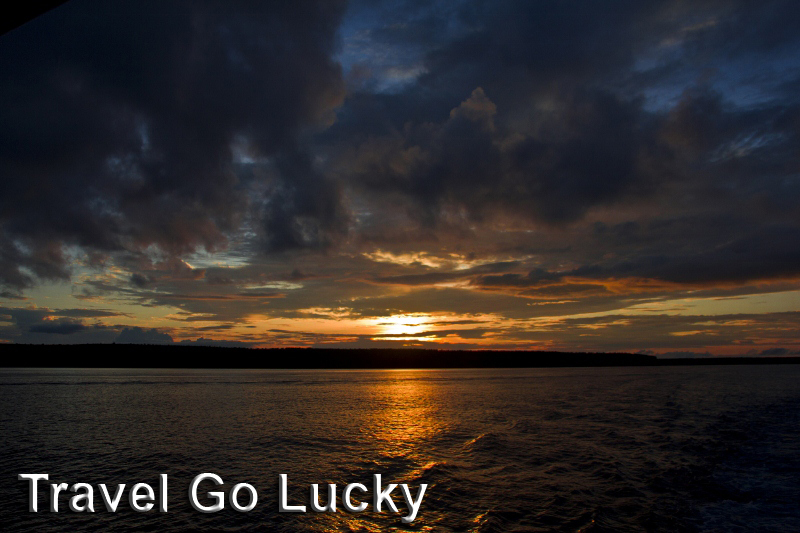 The sunset was picture perfect and a sign of good things to come for the remainder of our cruise. Dana and her birthday cake! 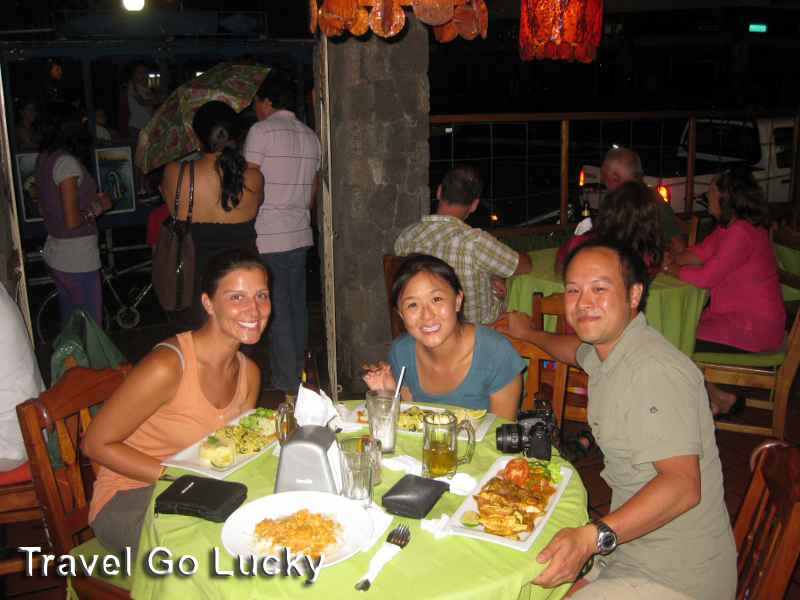 This entry was posted in Galapagos Islands and tagged Galapagos, RTW Travel, Travel. Bookmark the permalink.